Rinse FM and FOUND united this past weekend for the Born & Bred festival, showcasing some of the finest talent the UK has to offer. After the dramatic removal of headliner Azealia Banks, sounds on the opening day (Saturday, June 4) now represented an inclusive and truer reflection of London's soundsystem culture. The fusion of music was strictly vibes, from hip-hop to house to jungle and drum & bass, but the real winners were (no surprise) garage and grime, with a nice little sprinkling of UK funky. The first day saw The Square set off the afternoon with an upbeat session, with Elf Kid's "Golden Boy" attracting a large crowd over on the main stage. But the Lord Of The Mics tent was where it was really popping off. 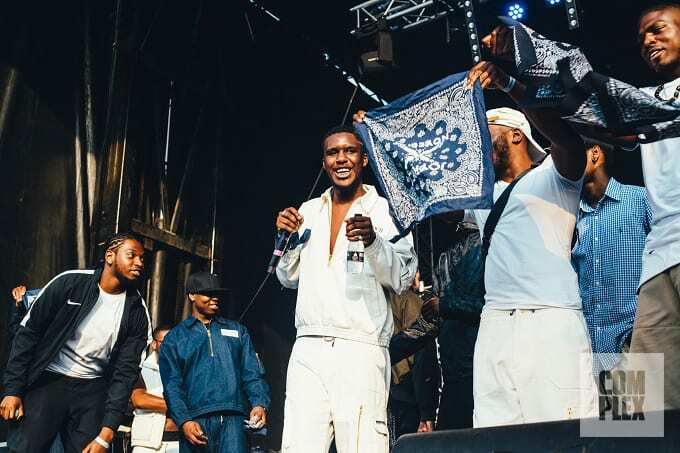 DJ General Courts took to the decks and it was curtains from there on out; Big Zuu, AJ Tracey, Jammz, Jay Amo and a whole host of fresh grime faces introduced the people to what being a lord of the mic really entails. With Wiley being a no-show on the day, legendary spinner DJ Slimzee had P Money with him to put on an unforgettable show up on the main stage. Spyro's epic "Rhythm & Gash" remix aligned with P's what did he say? bars whipped the crowd of all shapes, colours and sizes into something of a frenzy. DJ JJ then went back-to-back with Slimzee, and with the support of Cadell and Blacks, P Money illustrated all his years of touring in this potent performance. Newham Generals were next to bat, bringing their East LDN flavours to the fore as Footsie and D Double E's energy translated right back to the audience over tracks like S-X's "Wooo Riddim" and their own classic "Hard". While the first day's weather can only be described as dark and murky, luckily the music perfectly reflected that. Day 2: The atmosphere was so much more relaxed due to the sun shining its gaze on Haggerston Park. Rising artist Nadia Rose recovered a technical malfunction on-stage with a wavy acapella freestyle and a killer beatboxer by her side. Lady of the hour Kyla featured on Crazy Cousinz' UK funky and garage set to revisit her hit "Do You Mind", which was sampled on Drake's recent No. 1 "One Dance". With the crowd's fierce response, there's no question that this summer is going to bring a mainstream resurgence of these lighter dance vibes. Following them was south London's Novelist, who had a full main stage to illustrate why he's the young lord to watch on a global scale. His tour DJ Grandmixxer and Tugg Set crew warmed the ravers up nicely as he commanded "When I say energy, you say..." and the packed-out crowd responded: "Flavour!" Grandmixxer sliced DJ Mondie's "Straight" in with Dizzee Rascal's "Hoe" and Novelist was truly in his element, melding his "1 Sec" lyrics with these golden-era riddims. He was later joined by Visions Crew and co. to formally introduce his new Ruff Sound genre which mixes grime, jungle, and trap elements with more energetic rhyme schemes. Logan Sama and Spyro collided as a secret finale set when Lord Of The Mics and Rinse FM fused their dream grime line-up. The crowd were completely gobsmacked as old-time MC Bruza performed "Get Me" and shouts of Kill of killy! projected across the park from President T. No-one wanted to miss out on what was about to go down. Discarda was also on fire, taking to the mic with his wicked ad-libs alongside Slew Dem's Chronik, who together were consistent reload offenders.